When it’s used: In condensed formulas. What it means: Signifies that a substituent is attached directly to the preceding carbon. Why it’s useful: Without the bracket, the structure would be written CH3COCH2CH3, which might be confused for an ether. The bracket makes it more clear that it’s a ketone. Notes: Although not exactly obscure, it’s an aspect of nomenclature that can lead to confusion. When it’s used: for short chain alkanes and alcohols. What it means: n- means “normal” – an unbranched chain with the functional group (if present) on the 1-position. s– means “secondary”, t– means “tert“. Why it’s useful: Just a shorthand way of describing different structural isomers. Notes: n-hexane is another frequently encountered name, which simply represents a linear six-carbon chain. “Hexanes”, which you might see in the lab, refers to a mixture of different (branched) isomers of hexane. (it’s purified by distillation, and the isomers have very similar boiling points, so it’s sold as “hexanes”. Pure n-hexane is more expensive because separating it from its isomers is a royal pain). When it’s used: for amines and amides. What it means: The N– signifies that the substitutent is connected to the nitrogen. Why it’s useful: it removes ambiguity. “Methyl butylamine”, for instance, could refer to an isomer where the methyl group is on the carbon chain. Notes; when different substituents are present on the nitrogen, the terminology is N-(substituent),N-(substituent), for instance N-methyl,N-ethylbutylamine. When it’s used: for sugars and amino acids. What it means: It goes back to Emil Fischer, who designated the two enantiomers of glyceraldehyde (the simplest sugar) L-glyceraldehyde and D-glyceraldehyde. At a time (1890) where techniques for determining absolute structure were not available, he GUESSED(!) 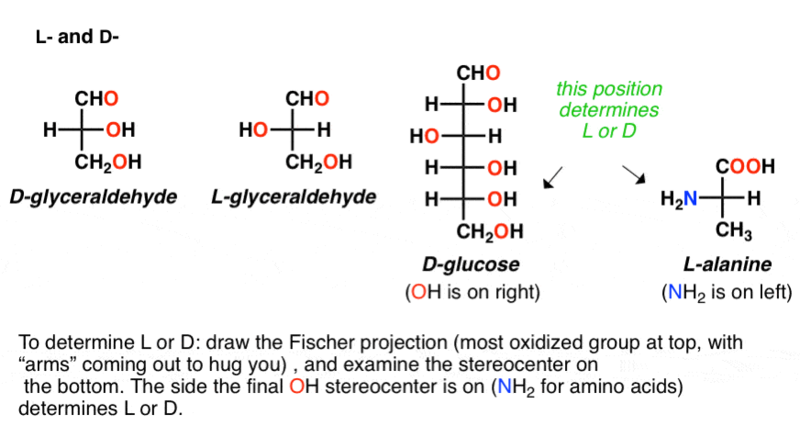 that structure of the leveratory (left-rotating) and dextrarotatory (right-rotating) structures of glyceraldehyde was as depicted in the Fischer projection, and gave them the prefixes L and D respectively. Thankfully, when X-ray crystallography was developed, it was found that his guess was correct. In L-sugars, the oxygen on the carbon second from the end is on the left hand side in the Fischer projection. In D-sugars, the oxygen is on the right-hand side. Why it’s useful: It was originally used to correlate the absolute structures of sugars to the two glyceraldehydes. It is no longer useful for this purpose, but like the appendix, it hangs around anyway. Like the appendix, it only seems to get noticed when it causes problems. Notes: This notation causes a lot of confusion. Just because something is “D” does not mean it rotates polarized light to the right and vice versa [that is the function of (+)- and (–)]. For example D-fructose rotates polarized light to the left (–). Furthermore, any correlation between L/D and S/R is coincidental. The 20 essential amino acids in the body are L-amino acids. They are all (S) except for cysteine, which is (R) (due to the sulfur having higher priority in the Cahn-Ingold-Prelog rules). Racemates are written as DL (for instance, DL-glucose is the racemic mixture). What it means: (+) and (–) refer to the direction in which pure enantiomers of this compound rotate plane-polarized light. (+)-indicates clockwise rotation, while (–)-indicates counterclockwise rotation. Why it’s useful: it depicts the direction of optical rotation. When it’s used: often used in NMR to depict the relationships between hydrogens, also used to describe certain types of products (e.g. bromination produces vic-dibromides). What it means: Vicinal refers to two functional groups on adjacent carbons. Geminal refers to two functional groups on the same carbon. Why it’s useful: Instead of saying “the protons are on adjacent carbons” or “the protons are on the same carbons”, you can say “the protons are vicinal” or “the protons are geminal”. Notes: remember “gem” like “Gemini”, the constellation and astrological sign, meaning “twins”. What it means: methyl protons are on a primary carbon (CH3). Methylene protons are on a secondary carbon (CH2). Methine protons are on a tertiary carbon (CH). Why it’s useful: In the case of methine, useful shorthand for saying “proton on a tertiary carbon”. When it’s used: Predominantly seen in naming sugars. Also used for steroids. 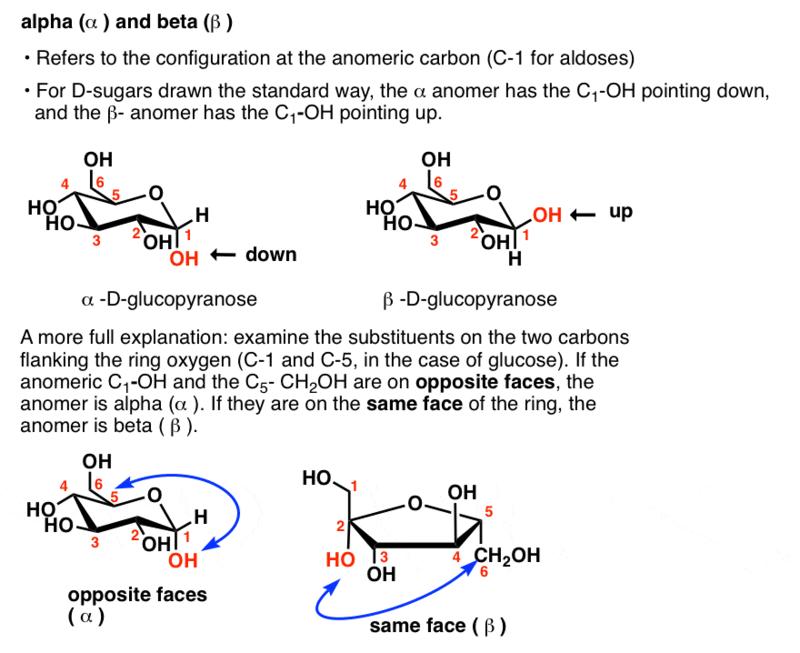 Notes: The sugar has to be drawn in this specific orientation in order to apply α,β (it is a convention). When it’s used: Kind of old-fashioned, but indicates a diastereomeric relationship between two compounds with adjacent stereocenters. What it means: Erythrose and threose are the 4-carbon aldoses and they are diastereomers. In erythrose, a the oxygens are oriented on the same side in the Fischer projection. In threose, they are oriented trans. The erythro- and threo– prefixes generalize this relationship to other diastereomers. Why it’s useful. To be honest, if you’re not going beyond sophomore organic chemistry, it’s probably not all that useful. Questions, comments, anything missing – as always, I want to hear about it. wow – this is a fantastic resource. what astonishes me is that i’ve not seen anything like it until now (not in a textbook or website). Thanks! That’s the goal… to try and make summaries of things that haven’t been summarized before. Great list! You know what would be helpful for readers like me is you have an ability to export these posts into pdf files to print out, or at least have some ability to easily print out these posts. Maybe there is one present on this blog, but I couldn’t find it. I know there must be a plugin for wordpress that allows this. You can try clicking on the post and then Print – you should get an option to Print as PDF, and there you go. This may be system dependent, however. It works OK on my home PC and office one, but not on the one in the library. Perhaps you need something like ghostscript or similar installed? Another nice piece of clarification! I would suggest that you add another notation used in organic chemistry conversations and contrasted with your number 8. That would be the use of Greek characters to refer to carbons counted from a functional group. For example, α,β-diketones, β-amino acids, β-keto esters, etc. What’s the “O” mean in 4-O-methylhonokiol? At the IUPAC system, the correct nomenclature of 2-butanol is butan-2-ol. The number of function’s position have to precede it. The purpose of nomenclature is to provide a unique, non-ambiguous way of translating a name to a structure. 2-butanol satisfies this criterion. It is also easier to say. The nomenclature system exists to serve us, not the other way around. I often see the “prime” symbol after a letter or number in the notation describing an organic molecule. For example, 2′-F, 2′-C-methyluridine-5′-monophosphate . I’m guessing the F means floro, but I am clueless about the primes. Help! Hello!, love your site, btw. It’s some bit of more obscure meta-info , but I can’t find in referenced anywhere…can you help?? The presence of identical unsubstituted radicals is indicated by the appropriate multiplying prefix di-, tri-, tetra-, penta-, hexa-, hepta-, octa-, nona-, deca-, undeca, etc. The presence of identical radicals each substituted in the same way may be indicated by the appropriate multiplying prefix bis-, tris-, tetrakis-, pentakis-, etc. The complete expression denoting such a side chain may be enclosed in parentheses or the carbon atoms in side chains may be indicated by primed numbers. This is very helpful. By the way, when there’s an “A” beside a number in the chemical name, what does it intepret? Sounds like you’re describing a tetracycline or similar cyclic compound. In complex ring systems there are weird IUPAC nomenclature conventions that I confess I haven’t tried to understand very much. Sorry, I don’t know. Could you help me by explaining the the use of alpha in the case of morphine’s IUPAC? I’m understanding that the numbers within are identifying the location in the structure in which these can be found but I’m still unsure about the part in parenthesis. Alpha means the substituents are on the “bottom” plane of the ring, but at this moment I can’t find out how which plane of the ring is defined as the “top” and “bottom” . If the stereochemistry of the alcohol on 6 was flipped, it would be labelled (5a, 6B)-17-Methyl….. Your articles are life-savers for organic chemistry students like me. Thank you! Glad to hear it Cassandra. Thank you. Hi, I just wanted to agree with the above praise. l-erythro-3,5-diaminohexanoate in a paper and needed to know what it is. Sure, I can google it but I also wanted to understand it. Thanks for the help! In section 4 on L- and D- enantiomers it seems that gluteraldehyde has been used instead of glucose. Awesome site. Thank you! But your rule #8 (alpha vs. beta) only applies to D-sugars. It is opposite for L-sugars.